After a brilliant start to the tournament, Australia’s performances fell away in the second half of the competition and it gave an insight as to how the team struggles in the absence of captain Aaron Finch’s batting at the top of the order. 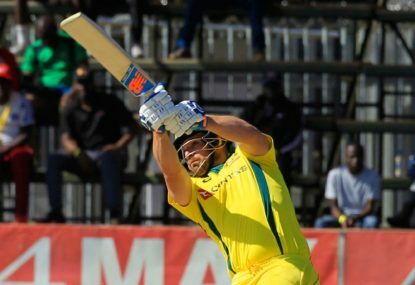 Finch, in the first two games of this tri-series showed exemplary form with the bat, breaking his own T20I record for the highest individual score and the matches were won with consummate ease. Then, it was followed by two back to back failures and a game was lost to Pakistan while the other went the distance against Zimbabwe, something one wouldn’t have expected given how poorly Zimbabwe’s performance had been in the series. Not to forget this was also nearly a second-string Zimbabwean side. That said, part of the blame for Australia’s defeat at the hands of Pakistan in their previous league match could be put down to their under-par bowling performance as well, one in which their bowlers a fair amount of short balls on a surface that might have been aptly made for fuller lengths. Pakistan had looked thoroughly outplayed in their first outing against Australia but showed their mettle as the number one team in the T20I world when they went on to crash their opposition’s party in their reverse fixture. In doing so, they also revealed their batting isn’t as bad as it was made out to be in the first game against Australia, and applying a proper mindset to building their innings could remain a key to their chances. Of course, that’s not to forget their bowling line-up presents a stern challenge for most batsmen around the world, including an Aussie side that will need the likes of Travis Head, Alex Caey and Glenn Maxwell to show a tad more restraint before they take on the bowling. The contest between the Pakistani spinners and the Australian batsmen continues to remain a fascinating one. The team batting second could have an advantage in this game with the bowling expected to be a lot better from both sides.